Happy Thanksgiving to all in the U.S. I'm thankful for time spent with family, and for all the people growing cacao and making great chocolate. Today was the last day of Chocolate and Fig Theme Week, and the first day of Chocolate and Rose Theme Week. 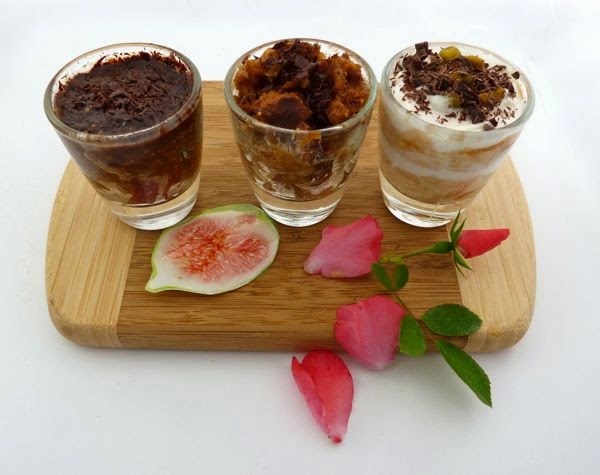 With this many food and chocolate flavors intersecting today (I'm giving pumpkin a rest this year), I decided to make a trio of small shotglass desserts with chocolate. What's better than one dessert? Desserts that are so tiny, you can have more than one. All three of these desserts incorporated chocolate from today's Organic 73% Super Dark bar from Trader Joe's (Monrovia, CA). The first dessert, served warm, consisted of brandy-marinated figs, atop a layer of chopped bacon, topped with a layer of melted dark chocolate in a shotglass. The second tiny dessert was a fig bread pudding -- with chopped figs and gluten-free raisin cinnamon toast, topped with chopped pecans, cinnamon, freshly grated nutmeg, and chocolate shavings. Last but not least, the third small glass was filled with greek yogurt flavored with rosehip jam, rosewater and cardamom, and topped with chopped, roasted and salted pistachio nuts. and chocolate shavings. 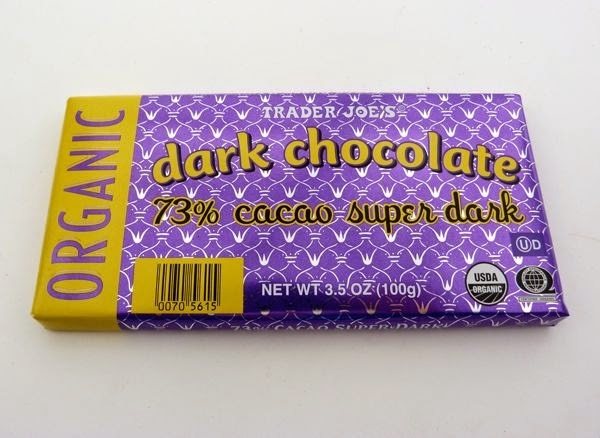 The Trader Joe's Super Dark bar was smooth, dark fun, with fudgy and nutty flavors. 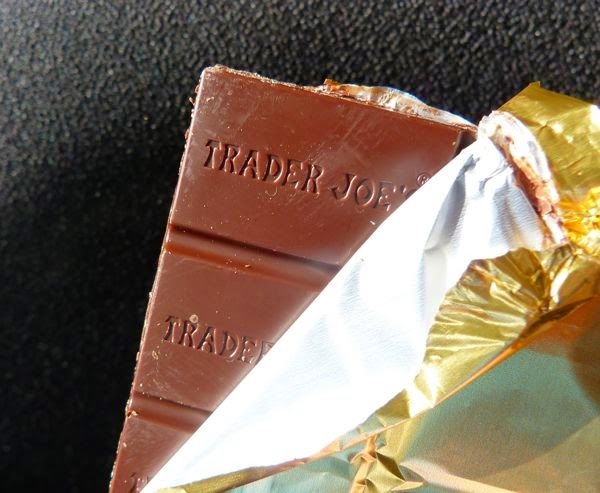 This organic bar was perfect by itself, or for livening up a dessert.